Homemade dumpling wrappers tend to stick together, so remember to cover them with plenty of flour. If you are not going to use it straightaway, then wrap it with a saran wrap. Place 2/3 of flour in a mixing bowl, salt, and gradually the water. Knead and add flour until the dough is smooth. Wrap the dough with a saran wrap, and let it rest for an hour. Remove the saran wrap and place the dough on a floured surface. Divide the dough into 4 pcs. Flatten each dough and place it through a pasta machine. Repeat the process for about 5 times. Then stamp the dough with a 10cm/4 inches round cookie cutter. Without Pasta Machine: Divide the dough in half and roll the dough into cylinders. Cover the dough with a saran wrap and let it rest for 10 minutes. Cut each cylinder into 20 pieces. 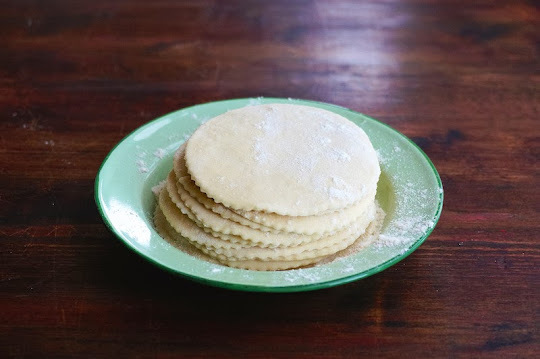 Place the dough on a flour surface and press it flat using your hand. Then roll out with a small rolling pin and working in a circular motion. Thanks for sharing this video along with many others. I miss Chinese dumplings and pan mee (I now live overseas), and with the help of your videos I shall try to make them for myself at home.